Springfield, MO. (April 20, 2016) - The Museum is thrilled to announce two major gifts to the #SaveTheFrenchFries Campaign, the Museum’s fundraising project for this year’s Give Ozarks on May 3. The Friends of the Springfield Art Museum and Bob & Sally Scheid have both pledged $3,000 toward the Museum’s $17,500 goal. These funds will provide for the restoration of John Henry’s Sun Target II, better known around Springfield by the moniker “The French Fries,” as well as several works by Ernest Trova on the Museum grounds. Sun Target II was acquired by the Museum in 1980 with assistance from the Missouri Arts Council and the Ola E. McAdoo bequest. It has since become a defining piece of Springfield’s cultural landscape and its local identity. 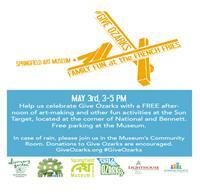 The Museum has joined with the Humane Society of Southwest Missouri, the Lighthouse Child and Family Development Center, the Discovery Garden Montessori School, and the Ozarks SySTEAMic Coalition (O-STEAM) to host an afternoon of art-making, science activities, face painting, music, animals, snacks, and lemonade on May 3 from 3 to 5 PM at the Sun Target II, located at the corner of National and Bennett. This event is free and fun for all ages. Donations to Give Ozarks will be accepted at the event for each of the participating organizations. Online donations to these organizations on May 3 automatically enter them into hourly drawings for prizes totaling $100,000. These prizes were secured from generous sponsors all over southwest Missouri by The Community Foundation of the Ozarks.